One of the most rewarding current culinary trends is chefs who are genuinely excited by very old ideas. This started with the Slow Food Movement in the late 1980s as a reaction against consumerism and evolved into an aesthetic revolution. The prevailing trend of the era was toward convenience food and flashy presentations. The countermovement found new wisdom in ways grandmothers had been cooking for centuries. Chefs and the public learned a new appreciation for meats braised in Dutch ovens and clay pots, for pork cheeks and beef offcuts, vegetables cooked past al dente, for housemade pickles and sausages. The virtues of all these things were no surprise to the people who never abandoned the old ways in the first place, particularly Mediterranean communities who found their style of dining acclaimed as the model for the world. Those traditions are served in high style at Gabi James, the Riviera Village eatery that offers the cuisine of Southern Spain and France. The previous restaurant in this space, Zazou, was under the same ownership but focused on modern interpretations of French dishes with North African elements. Gabi James is more modern in décor, more traditional in culinary approach. 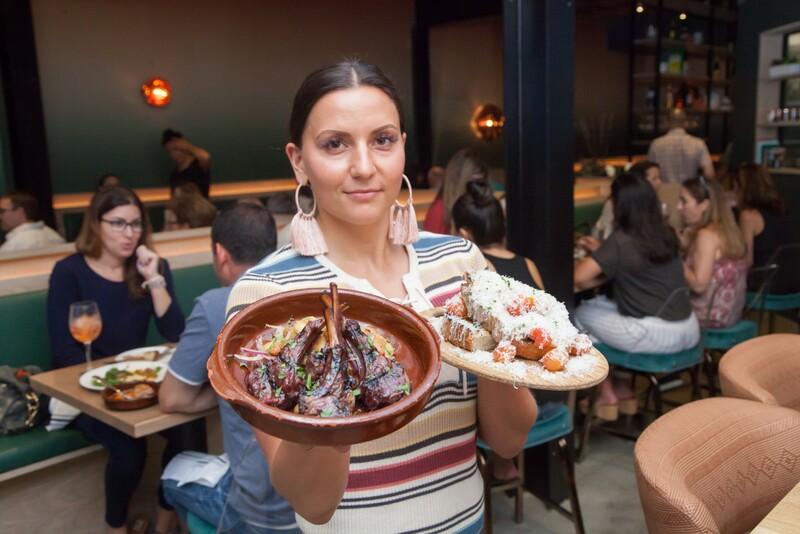 The heart of any Mediterranean meal is a procession of small plates at the beginning, and Gabi James offers items that would be called tapas if this was a purely Spanish restaurant. There are many seafood choices, among them the brandade gratin, chickpea and shrimp fritter, and a delightfully odd item called anchovy matrimonio. Brandade is the name for dried, salted codfish, a staple for seagoing people for centuries. The codfish is rehydrated, mixed with mashed potato, olive oil, and garlic, and used as a dip for bread. In the Provence region they run it under a broiler to intensify the flavor and add some extra texture and that’s what they do here. It’s silky smooth, very rich, and may make you rethink your attitude about codfish. Americans favor mild seafood, but here a full flavor is made very appealing because it is in perfect balance. The anchovy matrimonio is even more challenging, because it starts with anchovy, which most people think of as smelly little fish served on top of pizzas. That type of anchovy is heavily salted, and the flavor intensifies when they are baked. The ones served at Gabi James are preserved in oil so they are much milder, and in this dish they’re mixed with caper berries, chopped shallots, a dash of chili, and shaved fresh butter. Adding cold butter to fish may sound strange, but the sharpness of shallot, pickled capers, and chili makes it all work as an accompaniment to thick whole grain toast. Both dishes might have been found on any Spanish fisherman’s table of the last five centuries and are examples of rustic Mediterranean flavors. The chickpea fritter with chopped shrimp is more modern, because it takes the true flavors of the region and presents them in a new setting. Chef Christopher Feldmeier was previously at Pizzeria Mozza, which also has a tradition of respectful innovation, so he has practice at this. In this case chickpeas, scallion, and chopped shrimp are made into a patty and fried crisp, then topped with some freshly made yogurt and a sprinkle of paprika. It’s a simple idea that shows the quality of the ingredients, which is just what it’s supposed to do. I have also tried his housemade Merguez sausage starter and turkey meatballs in a mild ancho chile sauce. Merguez is a spicy lamb sausage invented in Southern Spain during the Moorish period. Cumin and pepper show the Arabic influence common to dishes from this region. At Gabi James the coil of sausage is served with a topping of cilantro and a dab of mechouia, a chopped salsa of cooked eggplant, peppers, and other vegetables. If you have a liking for fairly spicy food you should try this, but be warned, the heat is cumulative. There’s a little heat in the sauce on the turkey albondigas, too, but it’s a controlled burn rather than a raging fire. The turkey is ground very finely to achieve a moist, even smoothness, unlike most turkey meatballs which are dry in the middle. Ask for an extra piece of bread with it because you’re going to want to mop up all the sauce. You may think of having a glass of wine with your starters, but if you like cocktails take at least a momentary detour to the spirits list. They have some extraordinary Spanish and French gins with quite different flavor profiles than anything you’re probably used to. French gin makers often use a lot of lavender, and the floral aromatics completely change a drink. There are a few gin and tonic variants on the menu, and in heat like we’ve had lately the fragrantly herbal drink called “Summer in Provence” is particularly cool and refreshing. They also make a lovely sangria here, so as much as you may enjoy your regular wines this may be the place to try something a little different. Among the mains I have tried are braised chicken, pomegranate-marinated lamb chops, and fideua, which is like paella but made with pasta rather than rice. The fideua was easily enough for two, a big portion of noodles fried slightly crisp and tossed with shellfish and squid in a squid ink aioli. This dish from Catalonia is everything you like about paella but with a different texture and a creamy garlic flavor thanks to the aioli. I usually associate pomegranate lamb with Turkish and Armenian cooking, and what it’s doing here I don’t know, but it’s delicious. Pomegranate molasses and garlic are a lovely combination with full-flavored lamb, and the three good sized chops had the balance of caramelized fruitiness and smokiness from the grill. It was served with crisped gigantes white beans in a salad with red onion, tomato, and lemon, a combination that needed no further enhancement. Steaks and whole fish items were on the menu, but I was most curious about the one that encapsulates old fashioned cooking, a braised half chicken. Braising was popular among the poor because it can be done at low heat, which saves the cost of fuel, and long slow cooking can make even an old bird tender. I didn’t check this chicken’s ID so don’t know how old it was, but simmering in a sherry and onion stock made it extremely tender and infused a rich winey sweetness. It was served with a whole potato, thin-sliced before roasting and then topped with a dollop of yoghurt and herbs, which made a very substantial dinner. We didn’t really need the side that was described as a “marinated shell bean salad,” but I ordered it anyway out of curiosity. Shell beans are any kind of bean that is removed from the pod, as opposed to being eaten like green beans, and we didn’t know whether they were favas or something else. They turned out to be creamy white gigantes beans with olive oil and herbs, a nice simple accompaniment. We tried two desserts, a crème Catalan and housemade churros with dark chocolate dipping sauce. The churros were freeform drops of dough rather than the star-shaped version squeezed from a pastry tube, and they lacked the crispness of the Mexican version but were more moist at the center. They were just as delicious when dipped into the accompanying chocolate and cinnamon sauce, but I slightly prefer the crisper version. As for the crème Catalan, it was much like a crème brulee with more assertive flavors of spice and citrus. Since I find most crème brulees to be dull, I was perfectly happy with this. Dinner at Gabi James is modestly priced for the experience, though you can run the bill up if you like steaks or spend much time on cocktails. A fine meal with at least one beverage can run under $75 a person. That’s generous for a chance to enjoy classic traditions brought back to life, the French and Spanish riviera brought lovingly to Redondo’s equivalent. Gabi James is at 1810 S. Catalina in Redondo Beach. 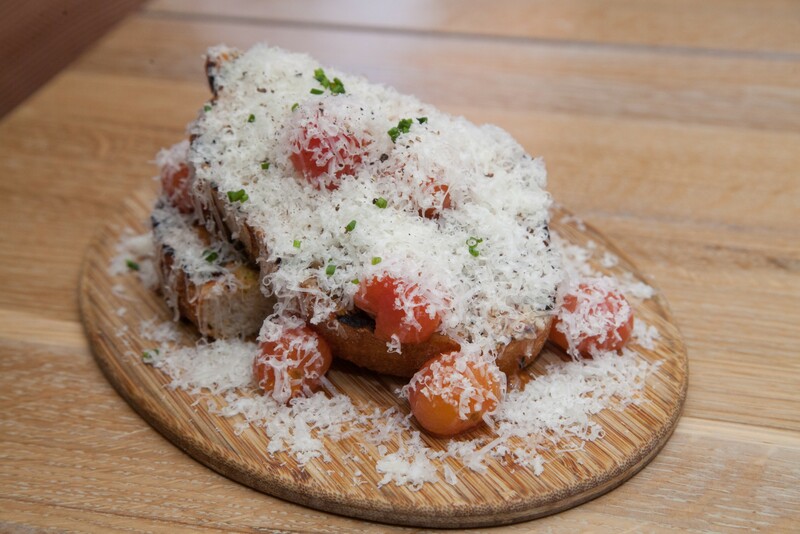 Brunch 10 a.m. – 3 p.m. Sat-Sun. Dinner 5 p.m. daily. Close 10 p.m. Sun-Thur., 11 p.m. Fri-Sat. Street parking only. Full bar, some vegetarian items, wheelchair access good, sidewalk dining. (310) 540-4884. Menu at gabijamesla.com.